If you’ve been keeping up with my recent posts, you’ll see that i’ve been exploring eyeshadows more recently and as we move into Autumn i’ve definitely been getting into more orange and red hues. I thought i’d some share some of my current favourites, and ones i’d highly recommend trying out. When it comes to eyeshadow i’ve always played it safe with my bronzey tones, but in my attempt to switch things up and use more of the palettes that I own i’ve been loving exploring tones more out of my comfort zone, and i’ve received some lovely compliments. An eyeshadow duo that popped through the post a couple of weeks ago comes from 3ina, and at first I really wasn’t sure about the shades of The Duo Eyeshadow 605* (£10.95) as i’m definitely not an orange/yellow eyeshadow gal but i’ve been mixing the matte orange shade in with my more golden bronzy tones and i’ve loved the little extra pop of colour that this gives! I also have been adding the yellow shimmer shade into the inner corners of my eyes for a little shimmery pop, and all in all this little duo is perfect for Autumn. A few other shadows that i’ve been talking about quite a bit recently, and rightly so are the Freedom Makeup HD Eye Foils* (£5) in the shades ‘Metallic 1‘ and i’ve been really enjoying the red and copper tones from this little set. I love the warmth that these shadows gives and I find they really make the green in my eyes pop, and work so well with the neutral tones that I always wear. I also love how shimmery these are and they really make my eyeshadow looks pop, and look that little extra festive. Finally i’ve really been loving getting back into my Urban Decay Naked Palette (£39.50) as I just forgot how much I liked this palette as you can do so much with the different shades, and i’ve been really enjoying playing around with this palette. I’ve been using this with the majority of my makeup looks recently as a base, or a starting point and then using the two previous shadows to create more of an impactful look. If you’re just starting to get into eyeshadows, or are looking to invest in a good palette I would highly recommend the UD Naked palettes as they are so worth the money, and work for so many different eye looks! 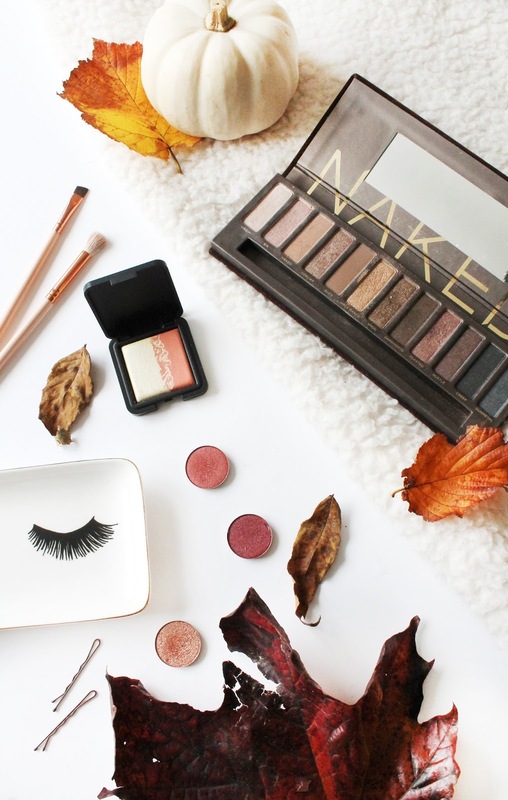 Have you been moving to more autumnal tones recently?